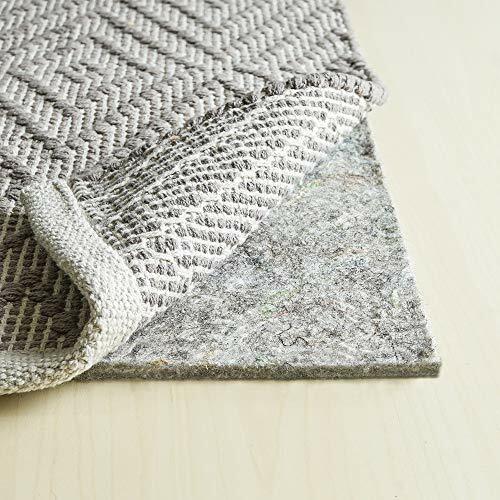 Our premium felt rug pads are made from 100% recycled fiber content, which is compressed into a 3/8 of an inch thick pad, tough enough to stand up to the heaviest traffic, also adding extra comfort and protection for your rug and all types of flooring surfaces. They also meet the credit requirements for USGBC LEED Rating Systems. Felt rug pads are an excellent choice for noise reduction and are also hypo-allergenic. RUGPADUSA Basics Felt rug pads will also preserve both your rug and your floors and are the leading choice for 100% premium felt rug pads. We also Contribute to LEED (Leadership in Energy and Environmental Design) for Low Emitting materials, Innovation in design, and for use of recycled content. Approximately 3/8" inch thick, Plenty of cushioning to protect your rug and floors.